A Net Entertainment and Universal Studios Production presents "The Invisible Man" slot machine based off the 1933 science-fiction film and 1897 book (by H.G. Wells). This 5-reel, 3-row, 20-line game can be played for fun or for real cash. The Invisible Man has plenty to offer, including auto-play, wild symbols, free spins, re-spins, multipliers and bonus features. You are given£5,000.00 in coins when playing for fun. Bet between£.20-£100 (depending on the coin value and level you choose to play on). Max bets give you a chance to win higher payouts and range from £2.00-£100. Letters, numbers, and various characters such as Dr. Cranley and Arthur Kemp appear on the slots and it's time to play! Choose from 10, 25, or 50 auto spins or manually spin. You can stop auto spins at any time. The highest win line is paid. Perhaps the best part of this game are the awesome WILD symbols and free spins. 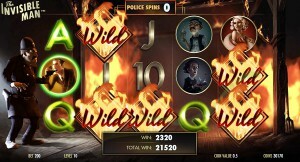 If you merge Police Wild and Griffin Wild together during free spins, you'll automatically earn an extra 4 free spins. If you merge them in the main game, you'll receive 10 free spins. Unlock bonus features (police spins and bonus game) by filling up each 8-space meter during free spin mode. When Griffin Wild or Police Wild move off the reels, one space is filled. If one meter is filled during free spin mode, the bonus feature is awarded after the free spins are up. The bonus police spins give you three spins with five random wild bonuses on the reel, so you have a high chance of a great payout.You have a chance to finally find the Invisible Man in the bonus game. You'll get to choose from five cards and have a chance to win three coin packages of various amounts. Your win can be multiplied by up to four times!